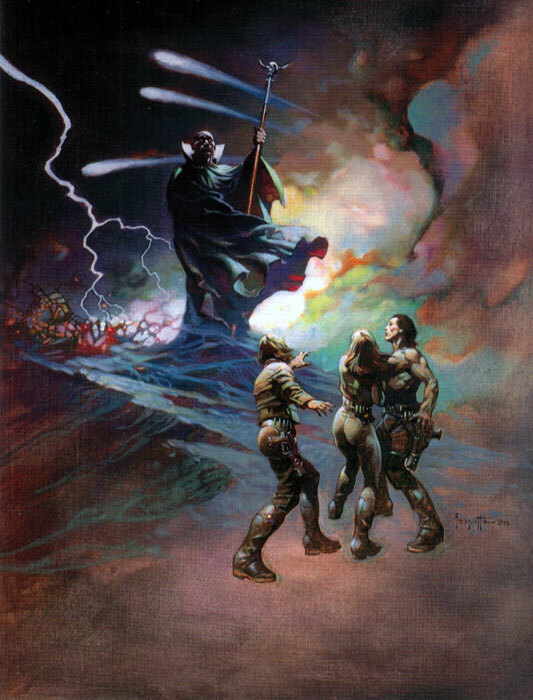 I finally found a scan of the original painting by the late, great Frank Frazetta for the TV Guide ads used to promote the Battlestar Galactica two-parter, "War of the Gods." See the printed ads HERE. As I noted when I posted the actual ads, by this point, Frank seems to have actually seen the series, or was at least provided with some costume reference, because, unlike his initial Galactica paintings, Apollo, Starbuck and Sheba appear to actually be wearing outfits that approximate the uniforms on the show (I bet Richard Hatch wished he had a build like that). You know, I love Patrick Macnee, but wouldn't it have been cool if count Iblis had looked like this? Awesome painting. I've been watching some BSG, and sorry I missed it so long ago now, but at least I'm getting around to it now. I bet this will look great on blu-ray. Frazetta always seemed an odd choice for Battlestar Galactica. Nonetheless his interpretation of the subject matter was very interesting, he made the subject matter his own and made it very Frazetta-like. The above painting for instance, looks a lot more sword and sorcery than SF. Really cool artwork. Too bad Frazetta never did any Star Wars illustrations. Apparently he was approached once by Lucas about doing some, but since Frazetta generally preferred the freedom to interpret material in his own style, he declined.